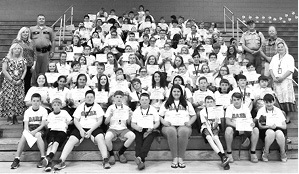 Students in the sixth grade at Clinton County Elementary School recently completed and graduated from the Drug Abuse Resistance Education (DARE) program that was taught for the past several weeks. The graduates are shown with their DARE diplomas in the photo below. Above, Sydnee Muse, was the winner of the DARE essay contest and is shown being congratulated by Clinton Elementary School Principal Angela Sloan, Kentucky State Police Trooper First Class Jonathan Biven, CCES Student Resource Center staff Tonya Thrasher and Kim Craig, Clinton County Sheriff Jim Guffey and Clinton County Judge/Executive Richard Armstrong. For her winning essay, Craig won a week of summer camp at Trooper Island Camp along with three of her friends and a $100 saving bond from Kentucky State Police Trooper First Class Biven, who was the instructor for the DARE course.